NOTE: If you are using a Mac computer to access the camera’s web-based setup page, click here. Once the camera’s web-based setup page appears, click Setup then Users. 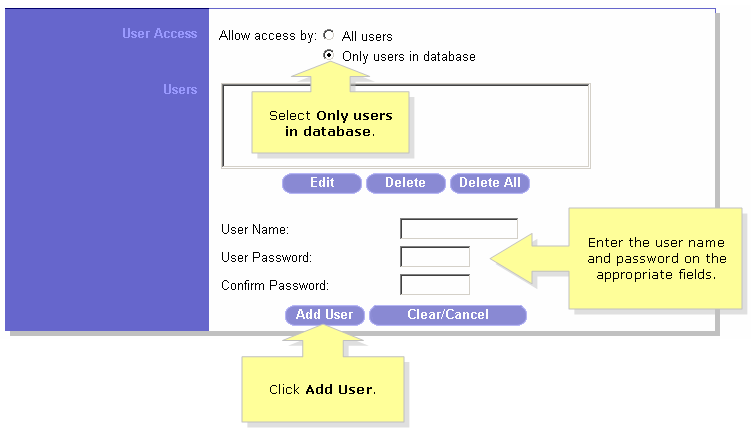 Under User Access, select Only users in database. On the allotted fields below enter the User name and Password on the appropriate fields and click Add User. Once you're click to set your preferred settings. NOTE: All the users that been registered in the database will use their own username and password assigned by the admin. Choosing All Users inside the User Access option will require a single User name and Password for all users. The account cannot be accessed by two or more users at the same time using the same username and password.